Today, I attended my last celebration call with two awesome women. Together our experiences spanned several decades, the rural-urban divide, healing arts, motherhood, life and death, and so much more. Our ties--our calls--first began in 2011. In 2010, I participated in a self-paced online entrepreneurial coaching program designed to help other entrepreneurs launch a similar kind of program. The facilitator of the program often led calls that were upbeat and inspiring. Homework was clear and exciting. Participating in the Q&A calls helped me stay connected with my peers who were also moving forward with upgrading their services, making them web-friendly. So it was easy to stay motivated and hear about their successes. I often looked forward to those calls. At the time, as a first-time stay-at-home mother of an infant who hadn't quite let go of the concept of working, I was interested in creating an online consultation adaptation of my on-site feng shui consultations. I thought I would create a video series, conduct Q&A group calls, and also have one-on-one clients. The factors I did not consider were related to the background noise. I realized soon enough that I could not successfully record my videos without interruption. Nor could I conduct any calls without disruption due to my child's unpredictable needs. Neither were my one-on-one client sessions professional in that the receiving party would have to cope with my child on the line. Because I could not progress fast enough (or quantitatively so) with crafting my own online program, I eventually abandoned offering the online version of my feng shui services and even offered a heavily discounted on-site consultation for a fellow mother just to test out how it would be if I brought and wore my infant for the session. Although the mother was very grateful and understanding and even reportedly benefited from my session, out of integrity for the professional provider-client relationship, I chose to close the door on offering any more feng shui services--online and on-site--for an indefinite amount of time. Needless to say, I was feeling pretty depressed that somehow I was now limited to only my role of mother. Plus, I was already "behind" in my self-imposed, self-paced studies. I felt stuck and isolated, suffering from undiagnosed postpartum depression. Because I was also the first generation to ever stay at home as a mother, I had a huge learning curve. I was so used to being a Type A personality, constantly doing something, that I suddenly didn't know what to do with myself. Caring for a baby required a whole set of other skills, ones I had very little prior transferrable skills. Everything I had in my life prior to motherhood, everything that fed me or refreshed me, everything that was uniquely for me--everything was gone. Stripped to the bone was how I felt. No, I felt stripped to the bone marrow, recalibrating every cell of my existence in this journey forward in motherhood. As the weeks turned into months of stagnation and no one else seemed to be able to relate to my situation, I realized I was quickly spiraling into a nameless state of ever-mounting angst. About a year into my self-paced studies, the facilitator of the program mentioned an opportunity--a weekly 30-minute celebration call that was optional for participants to sign up for. Each call would have four people present, each person to share their celebrations for five minutes. After each person shares their celebrations, other people on the call take about two minutes total to acknowledge the celebration. The premise of the call was to presence the importance of celebrating our accomplishments--no matter how small. When we celebrate, we raise our vibration. When we celebrate in a group, we raise our vibration by quantum. So I jumped at the chance to participate in this extracurricular activity. I looked at the list of people who had already signed up to moderate a group and quickly entered my name in one of the groups. Several things kept changing before the first call as the sign-up dust soon settled. When it came down to it, two people dropped and only the moderator and I were left in the group. So the moderator called a friend of hers, who was willing to join, and we proceeded as a group of three. Although another woman joined and participated in our group infrequently for awhile, she transitioned out when the year ended and another began. Then a man joined our calls infrequently as well. Throughout most of our calls, I made it to celebrate with the moderator and her friend. At the beginning of our calls, I learned that the three of us shared our passion in the healing arts. Beyond that, I was uncertain how much I could contribute. I found the task of celebrating kind of like a muscle. Every week, I went to my celebration gym. Early on during the calls, I was unsure about just want to mention. I was also quite unsure about myself being in the group given that I was just over thirty and the two women on the call were going through menopause. As I grappled out of postpartum depression, each week I struggled to find one or two things to mention for our call. As our calls moved forward though, we found many ways to connect with each other and many things to celebrate. We learned so much from each other. Every call required an unspoken commitment to make the call and celebrate our lives. Every call started with celebration--of both "good" things and "bad"--and ended with so much appreciation. The experience was profound and beyond words. Over the three years of our calls together, I have given birth to two children at home and travelled overseas to two other countries with young children under three. I awakened to my mission to take my writing seriously and proceeded to change my focus from entrepreneurship to indie authorship. Embracing my mission I expanded my writing portfolio, previously limited to personal narratives in several traditionally published nonfiction anthologies, to include indie published editorship, short memoir and novellas. I transformed from wayward soul to anchored citadel with the fortitude to forge onward with my vision to fill the world with my words and someday make a livelihood from sharing them. I wrote this blog post in honor of these two women and the other two participants who were able to celebrate with us for a short while. Even writing love letters would be insufficient to describe the gratitude I have in participating in these calls. So I realize the best way to continue to honor our connection is to carry on the celebration at least on my end. Thus, I will do my best to celebrate and/or post a celebration every week. When my alarm goes off for the time that we shared for our call, I'll take that moment to think of a few things I would like to celebrate. For now, for this post, I will share my first online celebration in honor of our calls. What I'd like to celebrate right now is having more writing projects than time to fulfill them. As I write every word, I feel as if I am accomplishing more and more of what I have been set here on earth to do. That feeling of single-minded devotion to one's unique mission is so rich that I desire every person to be able to experience that in his or her lifetime. That being said, the final thing I want to celebrate is that in the past two months, I have been averaging ten dollars a month on my writing--most of which stems from my nonfiction. Prior to that, I have only earned about ten bucks for the entire quarter. I am very pleased with this result because I have done no little to no book promotions or advertising other than infrequent (biweekly/monthly) tweets about my work. I'd much rather be writing when I have time. So ten dollars per month is a good thing. Readers, if you are reading this post, I thank you for supporting my occasional delights. I was able to purchase grapes today and hope that one day my income from books will support my family's groceries. 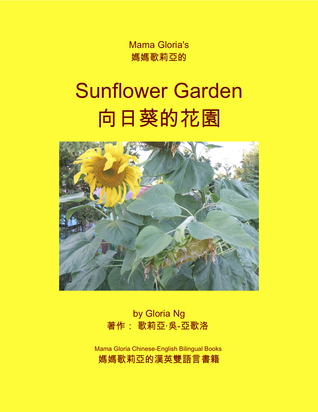 The lack of bilingual books to read to her children propelled her to create the Amazon bestselling Mama Gloria Chinese-English Bilingual Books series. Gloria enjoys hearing from readers, writers, and reviewers at GloriaNg.com.